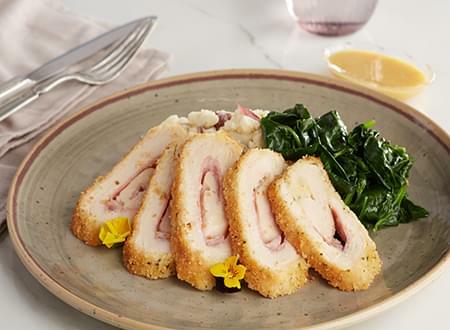 A delicious French classic, chicken cordon bleu is made of chicken breasts stuffed with ham and Swiss cheese and covered in Gluten-Free bread crumbs. Pan seared and finished in the oven, our healthier version is served with our own house made honey mustard sauce. CHICKEN BREAST, HONEY, MUSTARD, EGG, HAM, CHEESE, GLUTEN FREE BREADCRUMBS, OREGANO, BLACK PEPPER, BASIL, GARLIC POWDER, SUNFLOWER OIL. FAQs: How do I Reheat My Meals?? ?